Blogpaws, last week's pet bloggers' conference in Salt Lake City, was a grand time and many good things came of all the hobnobbing with other bloggers. 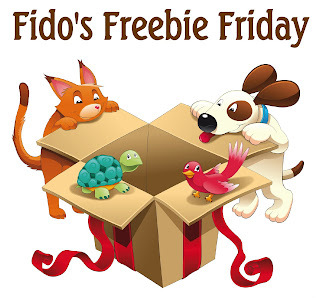 One is that Fido's Freebie Friday has a third co-host. Please welcome Dogtipper.com as our newest co-host. As we grow, so too does our presence. Dogtipper will help us bring you more and better giveaways, making our mini-mall of great pet products an even more fun place to shop for giveaways and contests to enter. Pet Product Review Tip # 16: Be sure to arrange your product giveaway with your company contact in advance and determine who will ship the prizes. If they are shipping the prizes to you in bulk for shipment to your winners, you may want to wait until they are received to run your review. Things happen! This past week's most popular giveaway categories were 1) a new car for dog families (duh! ), 2) pet toys, and 3) treats. I'm still noticing that late listers get fewer clicks, so you may want to mark your calendars and enter your posts here more quickly, at least as soon as you open them during the week. We reopen each Thursday at 4 PM ET. Good luck! You'll find assistance at our HELP PAGE, where there is a ton of other useful information for bloggers doing giveaways and reviews. Your hosts are All Things Dog Blog, Doggies and Stuff, and Dogtipper. I hope you'll stop by Dogtipper and let them know how happy you are to have them co-hosting. Doreen and I are delighted to welcome Paris to our team. Welcome and happy shopping! Individual rules of entry and guidelines for winning may apply to each listing. All Things Dog Blog, Doggies and Stuff and Dogtipper take no responsibility for the legality of the rules governing the listings on other sites and giveaways that are posted here. We simply provide this forum as a gathering place for pet product giveaways to be offered. Please consult All Things Dog Blog's Giveaway and Contest Rules for more detail. Ye ha! Watch for the Canadian Only giveaways--great stuff for you folks north of the border!